Love, love, LOVE this book. It has real, practical ways to strengthen the bonds of marriage, all based on biblical principles. Although I will say that even for the non-Christians out there, the ideas & advice in this book are good for anyone! Of course, it will help both partners in the marriage read the book & take its advice to heart, but better one person working to improve a marriage than no-one. And don't wait until you're in trouble to start working on your marriage! Do it now! 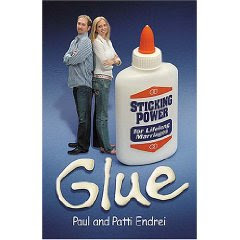 If your "glue" is strong, you won't break apart!